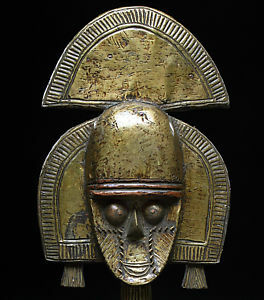 Types of Art: In recognition of the importance of the skull, representations of the head are found in nearly all decorated utilitarian items. Masks used in initiation and for education purposes are common. Statuary often represents the Fon, and many types of beaded and ivory objects, including stools which symbolize the seat of royal power are related to the Fon's investiture. History: The Kom are part of a larger cultural area known collectively as the Western Cameroon Grasslands and live in the northern part of Northwest Province. They originally came from an area to the north and migrated in various complex patterns throughout the last several centuries. Fulani traders moving steadily southwards into Cameroon in the 17th century forced the Kom's southern drift. Many smaller ethnic groups combined, while other factions split away as a result of pressure from the invading Fulani. During the late 18th century many Fulani converted to Islam and their expansionist mentality grew as a result of religious zeal. They successfully converted many Kom to Islam. Economy: People in the region played an important part in regional trade routes connecting with the seaport of Douala in the south and with Fulani and Hausa traders in the north. The Kom are farmers who grow maize, yams, and peanuts as staple crops. They also raise some livestock, including chickens and goats, which play an important role in daily sustenance. Women, who are believed to make the soil more fruitful, are responsible for the tasks of planting and harvesting the crops. Men are responsible for clearing the fields for planting and practice some nominal hunting. Political Systems: The Kom, like all of the peoples who make up the Cameroon Grasslands culture area, pay allegiance to the head chief (Fon). Each village is governed by a leader who is selected by his predecessor and who is usually the head of the dominant lineage within that community. Each Fon is served by a council of elders who advise him on all important decisions and who also play an important role in the selection of the next Fon. Most chiefs serve for a lifetime, abdicating the throne or stool only when nearing death. Complex age-grade societies also help to structure the community. The Fon also oversees these secret societies. Religion: The Kom reserve the highest allegiance for their lineage ancestors. Ancestral spirits are embodied in the skulls of the deceased ancestors. The skulls are in the possession of the eldest living male in each lineage, and all members of an extended family recognize the skulls as common heritage. When a family decides to relocate, a dwelling, which must be first purified by a diviner, is built to house the skulls in the new location. Although not all of the ancestral skulls are in the possession of a family, the memories of all ancestors are honored. The spirits of ancestors whose skulls are not preserved have nowhere to reside and may as a result cause trouble for the family. To compensate when a man's skull is not preserved, a family member must undergo a ceremony in which libations are poured into the ground. Earth gathered from the site of that offering then represents the skull of the deceased. Respect is also paid to female skulls, although details about such practices are largely unrecorded.